When rain water spreads across your front or backyard and stays there or it seeps into your basement, your property, your home, and your family suffer. Soggy wet spots and puddles that fail to evaporate can drown and kill your grass and make your properly unusable. If these water accumulations are close enough to your home, they can also leak into your home's crawlspace and basement. Additionally, puddles across your yard are unattractive and take away from your property's beauty and functionality. So how can you prevent your yard and home from detrimental water issues? Why is your property so highly concentrated with storm water? ...or how does it get into your basement? At Santarella, our experienced yard drainage experts use a time-tested process to determine the issue and arrive at the optimal drainage solution for your property. Our professionals start by examine your property's terrain, as well as neighboring properties including grading, roof runoff, landscaping, and saturation levels. Once we have identify the root causes, we create a detailed yard drainage solution, custom to your properties unique situation. Depending on your specific yard drainage issues, Santarella offers the following array of options and solutions from foundation grading to French drains to underground piping. Moreover, your yard drainage solution can also include drain pipes, underground PVC pipes, rain gardens, window wells, and basement waterproofing. Moreover, your yard drainage solution can also include drain pipes, underground PC pipes, rain gardens, window wells, and basement waterproofing. Regardless of the solution, Carmine Santarella and his crew are the right people for the job. For over ten years, Carmine has exemplified his expertise on outdoor properties throughout Union County. By offering affordable prices and giving your property project a personal touch, Carmine ensure 100% satisfaction with every project. With a decade of experience installing various features on homes and fixing yard drainage problems, Carmine demonstrates his dedication and genuine care towards his customers through each individual project. 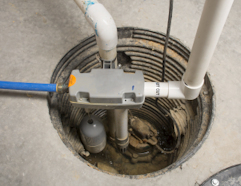 If water is seeping into your basement, installing a french drain and sump pump will solve the problem! When water enters your basement, it will be collected by the french drain and directed to the sump pump, which will push the water back outside where it belongs. Another ideal way to direct water away from your home is by installing French drains. French drains are trenches that lead water towards the lowest surface, enabling it to flow through gravel into an installed drain. After seeping into the drain, the water will follow a path leading it away from your home and into an emptying area. Installing DIY French drains is possible, yet very complicated and maintenance costs can become a nuisance. Therefore, hiring Santarella to install your French drains assures that your yard drainage solution is done professionally, effectively and cost-efficiently. Gutter downspouts lead roof runoff away from your home. 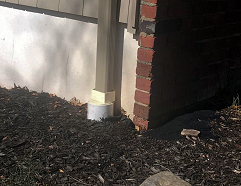 However, without installing underground PVC pipes, you run the risk of leaking that water into your basement if your downspout is not far enough away from your home's foundation. Therefore, you can avoid this possibility by connecting PVC pipes to your gutter downspouts to extend the roof runoff's path away from your house. 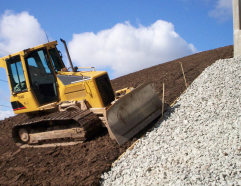 If your current grading consists of uneven surfaces and is causing flooding to your home, then grading is the easiest and best solution. 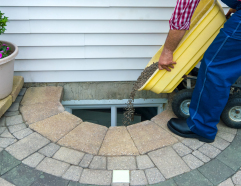 By raising the grade level surrounding your home or in your crawlspace, stormwater will travel away from your home towards sewers and street gutters. 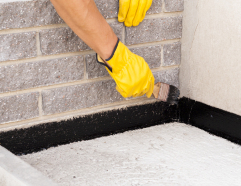 This alone can prevent flood damage, mold growth, and foundation deterioration, saving you money and improving the health of your home and family. both building a rain garden and strategically planting trees on your property not only enhances your home's beauty but also collects yard runoff. 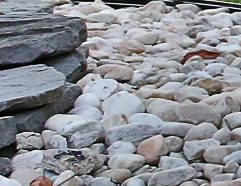 This yard drainage solution consists of plants and other objects, such as gravel and river stones, that allow soil to absorb water quickly. Swales are channels that connect downspouts to rain gardens. Overall, rain gardens offer the best of both worlds because they solve yard drainage issues and add to your landscaping's beauty. Installing a window well to your basement's exterior will not only let light into your lowest level but will also prevent water from seeping into your window. This semi-circle yard drainage solution collects rain water and avoids letting runoff pour into your home through your basement windows. 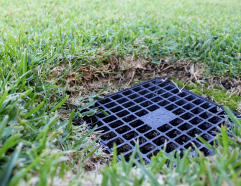 Dry wells are storage chambers that lead excess stormwater through drain pipes into the soil. Some people try to install a DIY dry well in their yard. However, dry wells are complex, and there is expertise required in the planning and installation to ensure they are an effective long-term solution for your property. 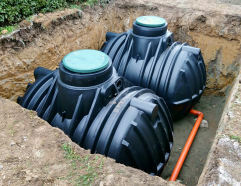 Unlike most yard drainage solutions, rain water storage tanks save runoff once it is collected. These tanks store rain water that drips off of a roof and into pipes. Rain water storage tanks prevent runoff from seeping into your home and enable you to utilize the rain water for other uses, such as watering your garden. All in all, your yard and home need to be dry. Whether it is installing a dry well or grading, Santarella will accurately assess your water issues and make recommendations to resolve your problem quickly, affordably and effectively. Talk to one of our knowledgeable drainage and waterproofing experts by phone at 973-564-7820 or email for a FREE consultation.